The Glestain T type is the most popular range in the Glestain repertoire and has a dimpled/scalloped side to the blade and subsequently this is not suitable for left handed users. The cutting blade is 50/50 meaning it is equal on both sides of the cutting edge and is easy to re sharpen on a stone. These knives are heavy in the blade and handle but are very well balanced they are tough and have taken a battering in the tests we put them through. Overall the chefs that tested the knives gave it a thumb’s up with an overall score of 8 out of 10. 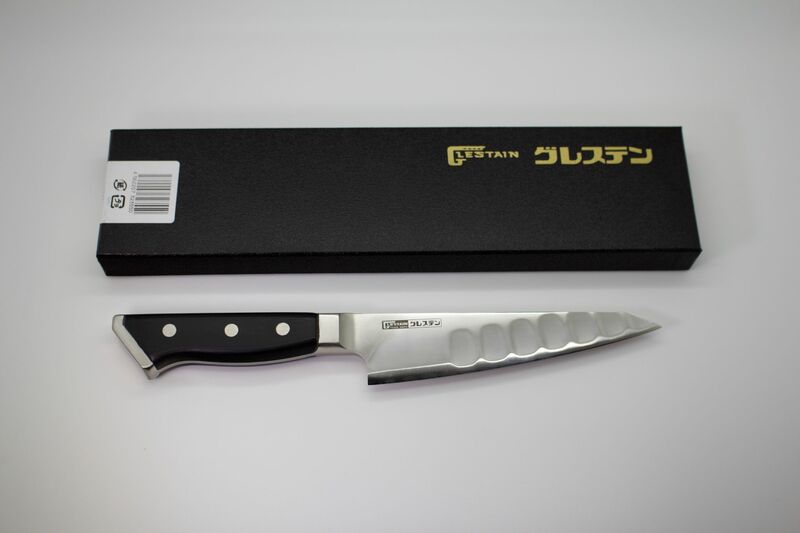 The honesuki knife is a butcher’s knife and used for braking down whole carcases or smaller boning jobs like four ribs and lamb legs. It takes time to get your head round this knife if you want to make the switch from a western style boning knife. But once done you will not look back as the blade is very heavy to hold which is meant to give you a better cutting edge. The blade has a heal to the with good knuckle clearance and can go through poultry bone easily.